You're invited to the film and photography exhibit of the documentary Monsieur Contraste, by award-winning film maker Rodrigo Dorfman. You can buy tickets ($5.) below. 50 seats only available each night. Doors open at 6:30. 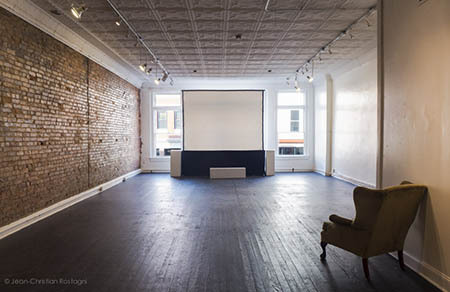 This unique event takes place at the Carrack Modern Art: 111 West Parrish St, Durham, from February 19 to March 1, 2014. Film is at 7:30. About this Event: for more info, event format, etc... Calendar: for list of dates and special features. The February 19, 21, 22, 26, 27, 28 and March 1 events are SOLD OUT. will be serving a superb Rhône Valley wine from Jean-Christian's very own region. This wine is at Wine Authorities in worldwide exclusivity! February 19, Film at 7:30 p.m.: Launch event in presence of Monsieur Denis Barbet, Consul Général de France in Atlanta. This event is created for the Triangle French community. 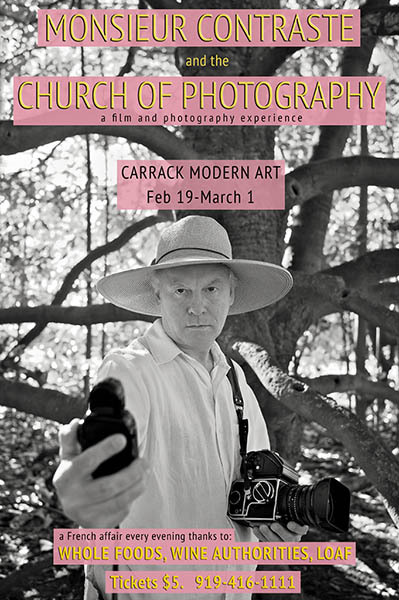 February 20, Film at 7:30 p.m.: Screening and Church of photography. February 21, Film at 7:30 p.m.: Screening and Church of photography. 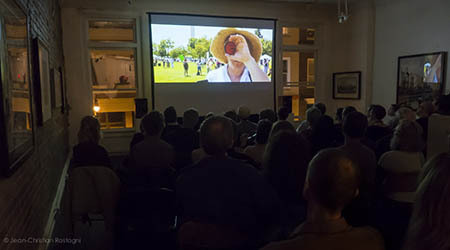 February 22, Film at 7:30 p.m.: Screening and Church of photography. February 23, Film at 7:30 p.m.: Screening and Church of photography. February 26, Film at 7:30 p.m.: Screening and Church of photography. February 27, Film at 7:30 p.m.: Screening and Church of photography. February 28, Film at 7:30 p.m.: Screening and Church of photography. March 1, Film at 7:30 p.m.: Screening and Church of photography, closing reception. 3/ Click on "Add to Cart"
6:30 Doors open, drinks and food, opportunity to preview the art. 7:30: Film starts at 7:30 sharp. 8:33: Church of Photography and reception. 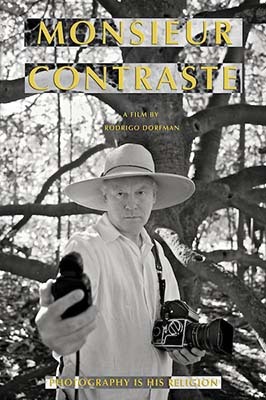 Monsieur Contraste, is a full feature documentary film by award-winning filmmaker Rodrigo Dorfman. See trailer. It is an intimate portrait of an artist who struggles with the demons of marketing, unfolds as Jean Christian Rostagni’s wife gives him one year to make some good money or face the prospect of bagging groceries at Whole Foods. Jean Christian, aka. Monsieur Contraste, sets up a home-grown art gallery in his house that he calls the "Church of Photography" and the rest is a really fun and provocative documentary about art, commercialism and the price an artist has to pay to remain true to his vision. See Director's statement. The Monsieur Contraste and his Church of Photography exhibit will give you the rare opportunity to experience a documentary in the same space as the photography exhibit of the works featured in the film. From the screen to the stage, in the blink of an eye, Monsieur Contraste will come alive before your eyes and take you on a tour of his Church of Photography. 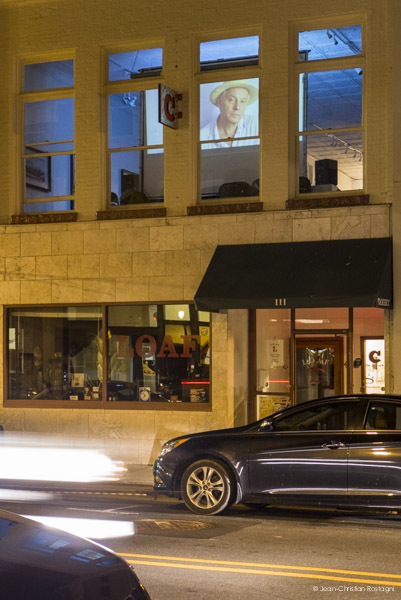 Part film screening, part art opening, Monsieur Contraste and his Church of Photography is a multi-dimensional art experience you will not soon forget. 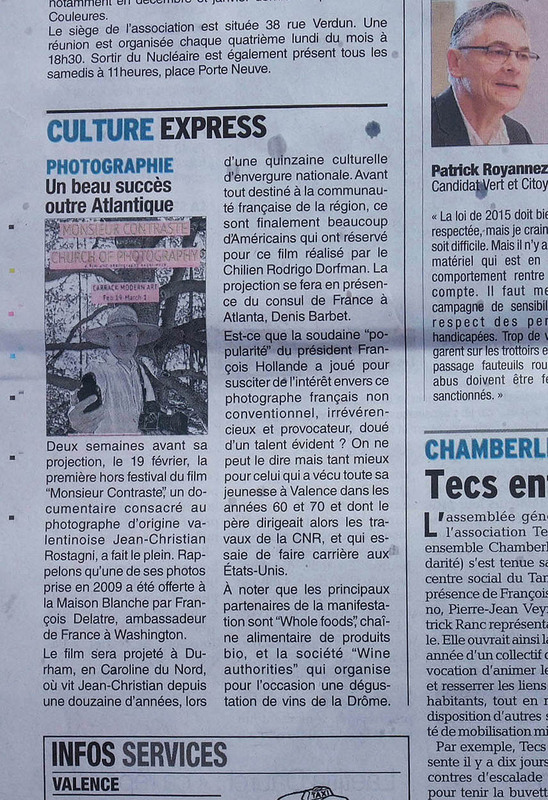 Review of "Monsieur Contraste" by David Fellrath in the Independent Weekly. February 12, 2014. Dauphiné Libéré, Valence, France, February 12, 2014. February 12, 2014. Consulat de France à Atlanta Portrait of Monsieur Contraste/Jean-Christian Rostagni. February 6, 2014. Pour la version française, cliquez sur "fr" à droite du titre.